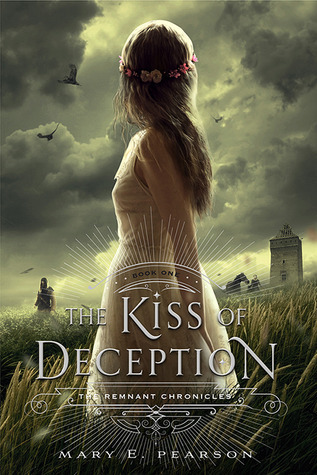 The Kiss of Deception is one of the most interesting YA fantasies out right now. I gave it top marks in my book review for its unique take on storytelling. The novel alternates perspectives between the main character, Lia, a prince and an assassin. Both characters are named in the book but are never associated with their respective occupations, leaving readers forced to guess which one is which! I nearly died from suspense. I recently chatted with Mary E. Pearson about her book's unique changes in point of view and writing and reading young adult literature. MP: Even though I often call it a genre too, I think YA is really more of a category that contains many genres--like the ones you mentioned. The only requirement for this category seems to be that a teen perspective is involved--and I love the teen perspective. Teens are passionate, questioning, curious, have a bit of the idealism I still cling to, and they're making decisions for the first time that can alter the course of their lives--and sometimes, the course of the world. I am not overstating this. Just look at Malala Yousafzai. Teens affect history, they affect lives, they affect our cultural growth and change, and yet and at the same time, they are often the most vulnerable among us. They have huge responsibilities and pressures, and sometimes few rights to balance those demands. Their stories are riveting, fascinating, and need to be heard. I'm glad that as a writer I am able to bring some of them to life. There's also a certain purity in the mistakes teens make. Stories are built on conflict and responses to conflict--without it, well, there is no story. I have infinite patience for a teen character who is, perhaps, making bad choices for the first time, but very little patience for an adult character who is making the same mistake for the tenth time. And if there's one thing a writer needs to get through 100,000 word manuscript, it's patience. How have you seen YA (writing and readers) change over the years? MP:The demand has exploded for one thing. Word has gotten out: YA books are well-written books that will make you think, wonder, scream, cry, cheer, and sometimes gasp. There is something for everyone. When I first began writing and I told people what I wrote I'd get a blank stare and sometimes a huh? They weren't sure what young adult literature was. Now everyone knows. I loved the alternating points of view in your book. What was the process like of writing both the Prince and the Assassin perspectives? MP: It was tricky. I wanted the reader to experience what Lia experiences when she finds out who is who, so I had to be careful about the details I revealed. It took several rereads and edits to make sure all my ducks were in a row and I hadn't spilled the beans inadvertently. Just as important to me as putting the reader in Lia's shoes, was wanting the reader to give each character a chance--just as Lia did--before it was revealed who they were. At the same time, I didn't want to use trickery so I also made sure the subtle clues were there, so a reader could see it was all there on a reread. Another important element in writing the two male perspectives was making sure Rafe and Kaden each had distinct mannerisms and voices so they weren't confused. It was helpful that they had chapters all their own early on because that got me into their heads quickly. Did you do any type of research for The Kiss of Deception? MP: Holy google search, did I ever. With my Jenna Fox books I did a lot of work at the library reading books and journals because of the technology I was researching. But with The Kiss of Deception, many of the things I was looking for were obscure details so I had to search the web for things like the history of harvesting ice and transporting it; herbs to repel vermin; how long it takes steel and various substances to decompose; the evolution and redirection of watersheds; the mechanics of knife throwing (There are tutorials on youtube); henna art and the process of applying it, and about a hundred more things at least. I also read books on medieval, colonial, and country life. A lot of the research, of course, never ends up in the final book, but you don't know what you'll need for sure until you are actually writing a scene. What books would you recommend to someone new to YA? MP: It would really depend on what they were interested in. For historical fiction/fantasy, The Thief series by Megan Whalen Turner, or His Fair Assassin series by Robin La Fevers; for contemporary realistic, We Were Liars by E. Lockhart, and some older favorites, The First Part Last by Angela Johnson, and The Killers Cousin by Nancy Werlin; for adventure, The White Darkness by Geraldine Mccaughrean; for dystopian, The Hunger Games by Suzanne Collins; for novels in verse, Glimpse by Carol Lynch Williams, or Ellen Hopkins' many novels; for sci-fi fairy tale retellings, The Lunar Chronicles by Marissa Meyer; for graphic novels, Stitches by David Small--like I said, there is something for everyone. I could go on and on! So many great YA books out there. I've read that as a child, you loved be a new "character" every day. Who did you love to be most often? Do you ever occasionally feel this way as an adult? MP: I think I was Little Red Riding Hood and Felix the Cat the most often. And yes, even today I wouldn't turn my back on a pretty red cloak and a magic bag of tricks. What books are currently in your to-be-read list? MP: I have a huge TBR pile that is waiting for me (and tempting me) as a reward as soon as I finish my revisions. Ruin and Rising by Leigh Bardugo, Grasshopper Jungle by Andrew Smith, and Dreams of Gods and Monsters by Laini Taylor are among them, plus I have some arcs of upcoming books that I can't wait to read. But first I have to get Heart of Betrayal done and onto someone else's desk! Can you tell us a little about or hint at what's in store in book two, The Heart of Betrayal? MP: Of course! Lia crosses into Venda, and discovers the kingdom of Venda is not what she expected. It is dangerous, complicated, and requires all of her energy and wit to stay alive--and keep Rafe alive too. Many want to see her dead, but there are a few who are fascinated with the enemy princess who is said to have the gift, and they might be the key to her survival. And then there's the Komizar . . . . He's not what she expected either. The Kiss of Deception is now available for purchase. For more book chats, reviews and YA book gushing, visit my blog, Read.Breathe.Relax.